I have read Steve D’Antonio’s article on “Get Home Systems” with great interest. Being a semi-production boat builder, I was approached a few years ago to create a get home power system. The boat was a 27’ Monaro, a planing hull model we manufacture in fibreglass. The main engine was a KAD 44 diesel I/O. The owner did not want an auxiliary outboard for aesthetic reasons, nor did he want gasoline aboard. I was unable to obtain any information regarding auxiliary diesel installations for a planing hull. The owner gave us fairly free hand to design something using a 9 hp Yanmar diesel. This engine was light enough and compact enough to sit tight beside the main engine on the port side. The prop shaft went through the transom a few inches up from the bottom and extended approximately one foot from the transom. Using a two blade folding prop, when not deployed, the blades were positioned just above the boat bottom. A fibreglass cavitation plate built in proved very effective. 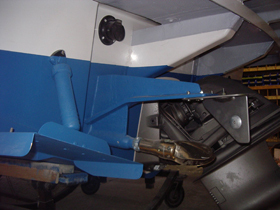 This first installation had a swing up rudder with its own separate hydraulic steering. To simplify later models, we used an adjustable skeg. The skeg created neutral steering and found the Volvo leg to be effective for steerage in relatively calm conditions. Also a little shot from the bow thruster helped to negotiate tighter turns. 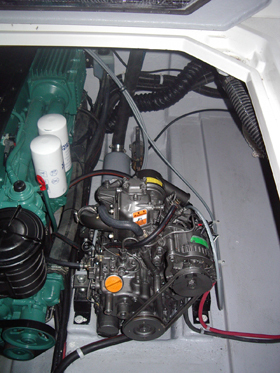 The alternator on the Yanmar, though small, provided enough power for the thruster and other basic electrical requirements. Top speed under auxiliary power was about 4 knots. Going astern, however, proved minimal.